Diane Kleist, Len Loomans and Fred Weston lead members of the group York Ready for 100 down to a solar array at Mac McAbee's Brixham Road home. YORK, Maine — More attention is being drawn by the day to the effects of climate change, said York resident Mac McAbee, and the subsequent need to cool down the planet by using renewable forms of power. With that in mind, McAbee and other community members have formed a new grassroots citizens’ group, York Ready for 100%. Its purpose is to raise awareness in York about the need to find clean energy solutions, with the goal of securing a commitment from all York residents to use electricity generated by 100 percent renewable sources by 2030. Conversion of transportation and heating to solely renewable sources is the expectation for 2050. These goals are similar to those of the town’s Energy Steering Committee, which is expected by summer to bring forward specific policy recommendations on first steps to achieve them. York Ready for 100% sees itself as complementary to the town committee – while the town works on policy, the group will work to educate residents and bring attention to the issue. For example, the group would support efforts to seek voter approval to incorporate the 2030 and 2050 deadline dates into the energy chapter of the town’s comprehensive plan. And then it would work to raise awareness and commitment from rank and file community members prior to voting. By the same token, members might mobilize people to advocate in Augusta in support of legislation, such as an offshore wind farm in the Gulf of Maine, which is again up for discussion under Gov. Janet Mills and has the potential to provide electricity to most of New England. She, McAbee and member Skip Schnable said the United States is replete with examples by communities, states and utilities to meet stringent renewable goals. Some will be explored in the film “Reinventing Power: America’s Renewable Energy Boom,” to be shown at the library Jan. 25 – the first of what the group anticipates will be regular events to raise public awareness. “The main thing is to get into the community, try to talk with people at various levels, and events like this film can help people think about what is achievable,” said McAbee. “You see the stories and the people whose lives have been changed for the better because they’ve implemented changes and are seeing good economic results,” Covino said. 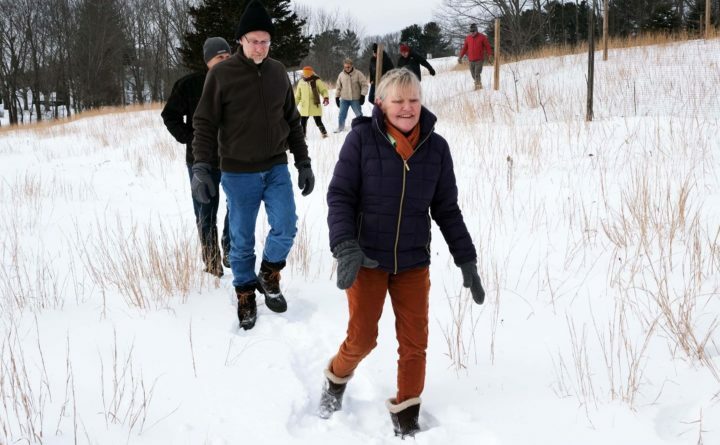 As one of their first steps, members of the group fanned out into the community and interviewed everyone from selectmen to fishermen, farmers and business people about climate change and potential commitment to renewable energy. — The film “Reinventing Power” will be shown at 6:30 p.m. Friday, Jan. 25 at the library. York Ready for 100% members will be on hand to answer questions about their group. — York Ready for 100% is affiliated with the Sierra Club initiative Ready for 100, which is working to motivate communities across the United States to commit to the 2050 goal. For more information, visit www.sierraclub.org/ready-for-100. — The group has a Facebook page, York Ready for 100%; a website is expected by mid-February. — For more about the group, email Mac McAbee at macmcabee5@gmail.com.